Gallatin River fly-fishing provides the pure pleasure of fishing the riffs and runs of a lovely river offering a serene setting, splendid views and plenty of large trout. 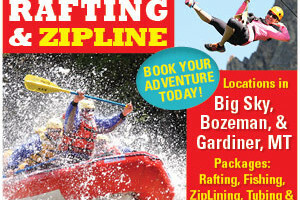 RAFT down the Gallatin, soar across the river on a ZIPLINE or pull out its fruits on a FLY FISHING rod! Family friendly; beginners & experienced. Discount Packages Available! Carrying on the tradition of top-rated guides, completely-outfitted fly shop, terrific online fishing reports and knowledgeable staff who cast, tie and educate anglers. Beginning at Gallatin Lake, the Gallatin River flows from its high mountain start for 115 miles to Three Forks, Montana. This river provides a wide variety of water and excellent access for those who are looking for some relaxing fly-fishing. The Gallatin River can be fast flowing, consist of some white water or become a slow-moving stream, depending on where you are. The flow doubles as it comes into view from its mountain headwaters and joins with the Fan, Divide and Bacon Rind Creeks. Sections are good for wading and some for float fishing. 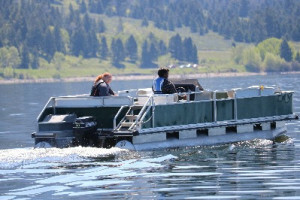 The prime fishing season is from June to September, with the mid-season being June and July. During mid-season the trout love the hatching salmonfly and thus, so do the fishermen. August to October is another hatching period for beetles, ants and hoppers. 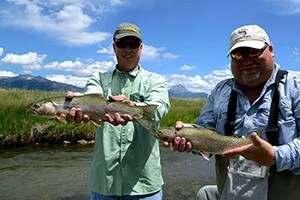 Feeding frenzies are common and a boon for fly-fishing. Even in winter, the brown, rainbow and cutthroat are willing to bite. The most common fish species on the Gallatin River are rainbow, brown and cutthroat trout. As the river enters Yellowstone, the fish you’ll catch are usually smaller but along the Gallatin in its long stretches you can still make catches of up to sixteen inches. Grayling are also found on Gallatin River. 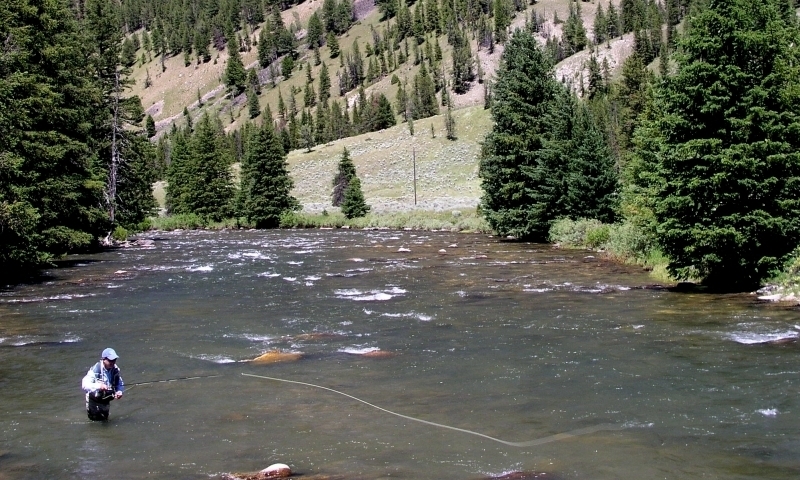 One of the most popular places to go fly-fishing on the Gallatin River is within Yellowstone National Park. You are not only enjoying your favorite pastime, but you also can marvel at the incredible thermal features of the park. 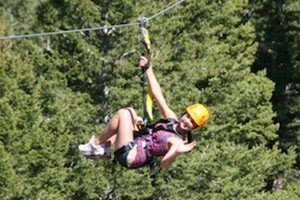 From the Yellowstone Park boundary to Big Sky, Montana, you will have excellent access to Gallatin River. You simply have to pull over to the side of Highway 191 (which closely follows the river) and go at it. For some terrific float fishing, try from the point where the Gallatin meets East Fork Gallatin River to where it joins the Missouri River. The access points are scattered, however, so you’ll have to locate them to get to the river. To really get to the best places at the best times, hire a fishing guide to help you make your trophy catch and get the most out of your trip.